Adjusting speed of auxiliary equipments such as fan and pump by variable frequency technology makes each parameter at the best state, which improves operation, enhances efficiency and saves power, water and coal, reduces production cost, brings lots of benefits for power plant. Meanwhile, inverter cooperates with control system of units, which can improve automatization level, save labour, enhance management level of whole system. 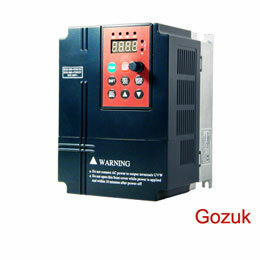 There are two aspects for inverter development in power plant. One is inverter itself development; the other is how to cooperate with progress of plant production technology and automatization. For inverter itself development: development in big capacity and small dimension, modularization, voltage withstand and hardware universal are research goals in short time. For application in power plant: manufacturer should improve inverter self-detection function; restore inverter fault quickly; solve problem of damper and valve quick response; digital connection to central system and so on. Furthermore, anti-dirt, heat, anti-disturbance and reliability should be researched and explored for a better mode. At normal start status, inverter will start and operate at given frequency in open loop mode, or operate at the expected value of the controlled object in closed loop mode. At soft start status, inverter will start and accelerate to the frequency of power grid regardless of the given frequency. When the output frequency of inverter reaches the frequency of power grid (set in main interface), then the output of inverter will become 0, at the same time inverter sends 'transfer to power grid' command. This command can make the control circuit to transfer the power supply of the motor from inverter to the power grid. During the transient transfer, there is a big inrush current. For synchronous transfer (OPTIONAL FUNCTION, synchronous transfer reactor is required), both inverter and power grid will supply the power to the motor during the transient transfer, there is very small inrush current. Quality inverters incorporate either an AC Reactor or DC Reactor (choke). Their inclusion in the basic design of the inverter allows the design engineer to maximize the advantages of the choke. Their function is to reduce the current distortion caused by the input stage rectifiers by slowing the rate of change of current, and thus charging the internal capacitor at a slower rate over a longer time. Some inverters allow aftermarket fitment of DC chokes but access to the DC bus is required. While it is easy to add AC chokes to the input stage, there is a disadvantage of voltage drop to the inverter that may have to be considered. The Harmonic Distortion caused by an inverter is related to its size & load, choke size, and the supply network parameters. With no AC Reactor or DC Choke, the harmonic distortion will be greater. 1 phase inverter normally is for small power electric AC motor speed control applications, with single phase 220V to 240V input and output 3 phase voltage (lower than input voltage), due to the compact design, this type inverter can be installed in a small space easily. An inverter can operate down to its minimum designed frequency, however the motor design and load characteristics determine the minimum PRACTICAL frequency. If the motor is force cooled and the frequency inverter is operated in vector mode, as long as there is encoder feedback, and the load is not excessive, it is possible to achieve 100% torque at zero frequency.